So I picked this beauty up this weekend!! It is a 27 inch ice chamber hookah, custom made in Lebanon for the military guy I bought it from on Craigslist. It has a crystal base, four hose ports, each with their own purge-valve cage before the hose ports, a drainage valve on the ice chamber, and a female stem. It also has an interesting ash tray that goes into the female port on top, and then the ash tray, being hollow and about an inch tall (not pictured) has 3 more female ports to accept all three of the male, Lebanese bowls it came with. They are all glazed on the outside, but unglazed on the inside. I cleaned it up, since the guy had only smoked out of it two or three times when he got it before he figured 'hookah wasn't his thing' and then it sat in a box for 20 years. So old, sure, but still like-new, which is also rare! Once cleaned up, and I removed all the bb's he had in the purge port areas before the hose port attachment, and replaced 3 with the plastic bb's you can get from pretty much most hookah sites these days. I marked the one port with a twist tie so I knew I could purge through that one, essentially turning the other three ports into purge valves, as, I typically smoke alone, though, I prefer at least one other friend to smoke with (something to be said here about the social element of the hookah world). I love it! It has a laundry list of 'honey-do's' I need to address to make it smoke the way I know that it can, and will, once completed. I couldn't resist this part, but my first bowl was also Starbuzz: Lebanese Bombshell. Yeah, I'm a ham like that. All I can say is 'wow.' I'm very used to unrestricted draws from my KM Platy Kamanja, so this was different having to hit it longer than normal. I had a single layer of heavy foil on the bowl, and 2x titaniums because they are still my favorite coal, though, I think I'm waning to the cubes these days and feeling less enchanted by the flats. 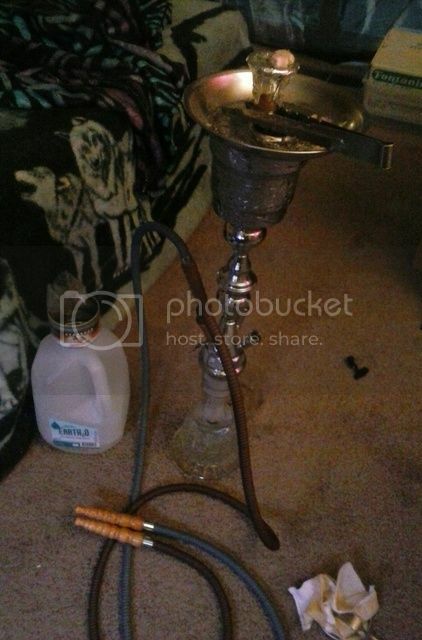 Had to share this gem, as it is older than most of the people I do end up smoking my hookah with. It seems, at least up here, that people 'fallout' of the hookah scene around their 20's for whatever reason. Their loss, really. Cigarettes aren't my bag. I got into vaping for a bit, and that's every bit as expensive, laborious, and involved as hookahs, but working with something traditional, and classy like a hookah trumps any mod box and RDA I've come across.. No offense meant to the vape scene people, but I'm falling out of the vape scene and sticking to my hookahs. Wow man, that's a great find. I didn't see this till now, that's pretty cool though, nice find. And yeah I agree on sticking with a tradition set up versus the vape, semi like counter part, I couldn't stick to it for long, things kept malfunctioning on me or breaking down, couldn't find any flavors that really had much umph to it and were nearly as good as shisha flavors can be, but that's just my opinion, like nakhla da for example, I don't think there's flavors out there for e juice that could compete with something like that, I typically smoke alone personally, but I do really enjoy setting up for friends who come by every week or so, get them into the hobby and such, And yeah the restricted draw is something I've heard that people swear add to flavor strength, I would have to agree. If I found a gem like that I'd either make it a DA only hookah, or give jurak/black leaf a try and if I like that, dedicate it to that instead, but again just me.